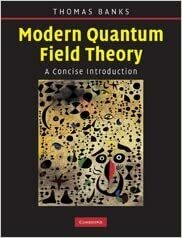 This comprehensive and progressive new text presents a variety of topics that are only briefly touched on in other books; this text provides a thorough introduction to the techniques of quantum field theory, which is the theoretical framework for constructing quantum mechanical models of field-like systems or, equivalently, of many-body systems. Covering topics such as Feynman diagrams and path integrals, the author emphasizes the path integral approach, the Wilsonian approach to renormalization, and the physics of non-abelian gauge theory. Banks provides a thorough treatment of groundbreaking topics such as quark confinement and chiral symmetry breaking, topics not typically covered in other introductory texts. The Standard Model of particle physics is also discussed in detail. Connections with condensed matter physics are explored, and there is a brief, but detailed, treatment of non-perturbative semi-classical methods. Ideal for graduate students in high-energy physics and condensed matter physics, the book contains many problems, which help students practice the key techniques of quantum field theory.